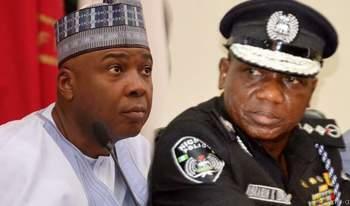 The Inspector-General of Police, Mr. Ibrahim Idris, wants Federal High Court in Abuja to quash the Senate’s May 9, 2018, declaring him an enemy of Democracy and unfit to hold public office within and outside Nigeria. On Thursday, Idris commenced the process of suing the Senate and its President, Dr. Bukola Saraki, by obtaining the court ’s leave, the order permitting him, to file a substantive action for “a judicial review” of the actions leading to the resolution passed by the Red Chamber. Justice John Tsoho, in granting the leave to Idris, noted , “I am convinced that the applicant has shown sufficient interest in the issues raised”. The judge granted the leave shortly after the IGP’s lawyer, Dr. Alex Izinyon (SAN), moved an ex parte application in that respect. “Leave is granted as prayed,” the judge ruled, adding that the order “shall be served on the respondents (Saraki and the Senate ), through the Clerk of the National Assembly”. The judge also added that “such service shall be deemed proper and valid service”.